Cost: Will the machine break the bank? Quality: Is the machine built to stand the test of time? Features: What makes the machine so special? Extras: Any unique features and technology to stand out? The Eclipse tops this category again in 2019. Much of this is because of its 2018 design improvements. Power: The Eclipse still has it's 3 and 4 vacuum motor models. This is power. No change here, they still dominate in this category. Cost: The price of the Eclipse has gone up a little over the years, but still competitive and lower than many extractors that do not come close in power and performance. The prices range from $2299 to $2999. Quality: This was improved in 2018. The Eclipse was always a quality machine. However, CleanCraft's 2018 redesign made some big improvements. We go through some of these down below. Features: The Eclipse has always been a feature rich machine. Items like 3 & 4 vacuum motor models, dual heating system, slide-out tray design, dump hose vs lift gate, drop-in dry filter, backside placement of hoses, convenient switch panel, etc. make the Eclipse a great choice. Extras: It seems CleanCraft also did some pretty cool extras to go along with their redesign. Checking out their website, they offer an Online Video Commercial that the carpet cleaner can use on their website. CleanCraft states that the video will help communicate the benefits of choosing your company because you are using the Eclipse and their Code: Green cleaning product. 1)	Better Rear Wheels - The new wheels are much more durable. These are heavy-duty 600 lbs rated wheels that will hold up to anything. 2)	Taller Machine - The Eclipse is 2in taller than the past models. CleanCraft made the bottom mechanical area a little taller. This design change allows much easier access to their "Slide-out" tray feature. By the way, this "Slide-out" feature is one of the best designs of any portable extractor! 3)	Improved Dual Heater - The dual heater is mounted a little differently and has much better insulation. The Eclipse seems to get even better heat than it did before. 4)	Dump Hose - The dump hose on some of the past models sometimes wore, because of the continual motion of dumping water every day. The new system "rubber" dump hose fits nicely on the unit and provides a more sturdy dumping solution. Way better than a lift gate dump system! 5)	Forced Venting System - The Eclipse now comes standard with 4 Venting Fans on the unit. Two are installed on the front of the machine that blow out, and two are installed on the back panel that blow air in. This works much a like a computer, and designed to continuously blow cooler air into the Eclipse electrical/mechanical area and blow warmer air out. Great idea! 6)	Components - The mechanical area also went through an overhaul and the individual components of the Eclipse area better designed. One such change was the vacuum motor mounting. The 2018 redesign changed this mounting to a much sturdier mounting system. This system also has a quick release to easily remove the vacuum motor when it is time to replace. 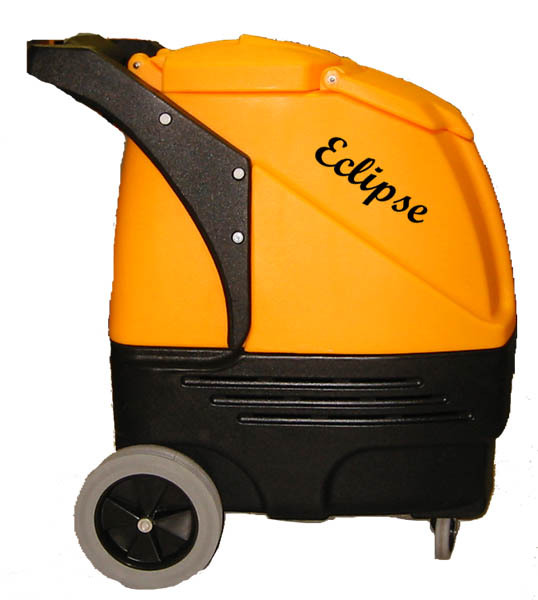 7)	Auto Features - For those carpet cleaners use to a truckmount where they don't have to stop and fill/empty their extractor, the Eclipse has "Rapid Connect" Auto options that can be purchased to automatically fill & empty while cleaning. These options actually snap right onto the Eclipse. Plus, these features can be added at any time after purchasing the Eclipse. You don't need to buy them with the Eclipse, and can get them later if your needs call for them. If you are looking to purchase a hot water extractor, you may want to put the Eclipse High Powered Portable Extractor on your list!